Otschi Tschornyje (Dark Eyes) [Russian] [4:12] Also available on the My Russian Homeland LP & CD. Poljuschko-Polje (Cossack Patrol) [Russian] [2:48] Also available on the My Russian Homeland LP & CD. Katjuscha [Russian] [2:16] Also available on the Crowning of a Great Career CD. Stenka Rasin [Russian] [3:37] Also available on the Crowning of a Great Career CD. 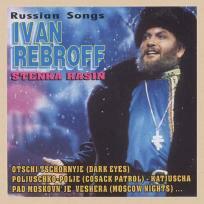 Pad Moskovn' Je Veshera (Moscow Nights) [Russian] [4:00] Also available on the Crowning of a Great Career CD. Wdol Po Piterskoj (In the St. Petersburg Street) [Russian] [2:10] Also available on the My Russian Homeland LP & CD. Natascha [Russian] [1:56] Same as on the Beim Klang der Balalaika LP. The right channel is silent for the first 5 seconds. Also available on the Russische Seele & Meine Reisse um die welt CDs. Wot Polk Paschol [Russian] [1:59] Same as on the Memories of Russia LP. Poshalej Ty Menja [Russian] [3:40] Also available on the My Russian Homeland LP & CD. Schto Nam Gorje [Russian] [3:48] Also available on the My Russian Homeland LP & CD. Grustj-Toska [Russian] [3:54] Also available on the My Russian Homeland CD. Tschubtschik [Russian] [2:08] Same as on the 25 Greatest Russian Melodies LP. Also available on the My Russian Homeland LP & CD. Ech, Dorogi [Russian] [5:03] Also available on the My Russian Homeland LP & CD. Krassawitza Rassija [Russian] [3:34] Same as on the Memories of Russia LP. Tjomnaja Notsch [Russian] [3:32] Also available on the My Russian Homeland LP & CD. Tschorny Woron [Russian] [3:26] Also available on the My Russian Homeland LP & CD. Stepj da Stepj Krugom [Russian] [4:18] Also available on the My Russian Homeland LP & CD. Ty, Sarja Moja, Sarja [Russian] [4:24] Also available on the My Russian Homeland LP & CD. Schysn Kasaka Apassna [Russian] [3:23] Same as on the Memories of Russia LP. Right channel is silent for the first 10 seconds. Matushka [Russian] [3:04] Same as on the Memories of Russia LP. Also available on the Meine Reisse um die welt CD.